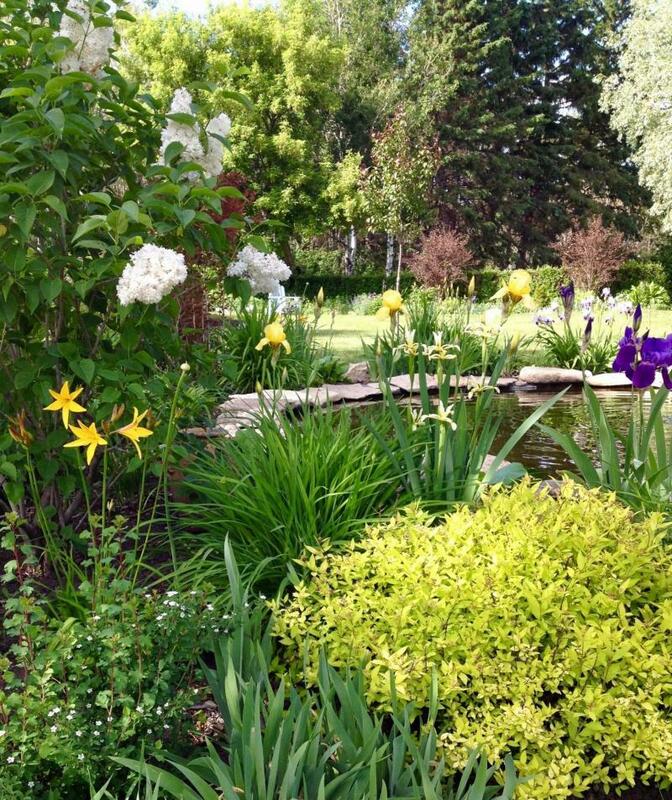 Val Thomson achieves artistry with perennial borders that are deep, varied and luxuriant. Val Thomson plants perennials in blocks and swaths. A sensory experience, John Tinkler’s cottage garden is filled with hollyhocks and other classic favourites. John Tinkler’s substantial L-shaped courtyard garden is surfaced entirely with reclaimed brick. John Tinkler and Val Thomson have an inspired association. Siblings, they have a common interest in gardening and enjoy sharing plants and exchanging ideas. 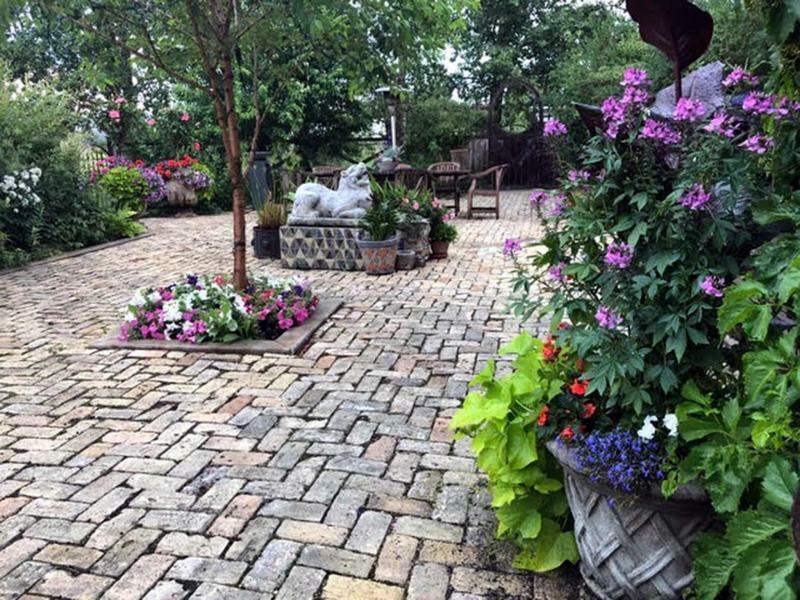 Both have expansive gardens — Thomson’s property is in Birtle and Tinkler’s is on the outskirts of Winnipeg — which leave an indelible impression on the many who visit annually. The vision for each of their gardens is informed by their English heritage and a quest for authenticity. Look closely and you will find a common thread in how this sister and brother approach the design of their gardens — they have a love for architectural quality and year-round form and structure in the garden, and both their gardens feature a series of garden rooms. But beyond their energetic motivation to continually reimagine and redevelop their separate urban and rural gardens, there is little discernible similarity between the two designs that might lead a visitor to guess Tinkler and Thomson are related somehow. "Being British, we have a lively sense of irony," Thomson says. "We’re not sentimental." But oh, how they dream and execute their separate visions for their gardens. Most gardens are a blink of the eye compared to Thomson’s spacious five-acre property in Birtle. Inspired by the landscape designs by the famous Dutch designer, Piet Oudolf, Thomson is transitioning her wildflower garden to a tapestry garden and has planted grasses and perennials in great blocks and swaths. Thomson is particularly adept at designing herbaceous perennial borders that are deep, varied and luxuriant. This new garden is completely different, she says, from any other she has created. "It’s a mix of grasses and perennials but more than just a stand of Karl Foerster feather reed grass," she says. Rather, it’s a space defined by different heights and vertical forms. Karl Foerster might figure in an area of about one square metre, but then you see sweeps of other grass varieties such as Tufted Hairgrass (Deschampsia cespitosa); Little Bluestem (Schizachyrium scoparium); Pampas grass, which her brother contributed; and Bouteloua gracilis (Eyebrow Grass), with flowering perennials interspersed. Thomson has moved 10 Thalictrum (Meadow Rue) from another garden room into this new space for its tall, lacy appeal. She also likes the strong architectural form of Verbascum thapsus (Mullein) and likes to repeat it throughout her design so that it appears here and there like tall sentries. "The spires are there because they make a statement," she says. "They’re odd and wonderful." Thomson lets them go to seed and then removes any she doesn’t want. Thomson has included several Geranium Rozanne in her borders but also likes Nepeta Sibirica Souvenir D’Andre Chaudron, an unusual tall-growing (90 cm) catmint with larger leaves and trumpet-shaped deep violet-blue flowers that bloom most of the season. Overall, Thomson says, this new space is about 150 paces long in a winding, amorphous shape as little as 120 cm wide in some places and as much as six metres wide in others. A woodchip path separates this new garden from another she is developing. Inspired by her visit to the famous White Garden created in the 1930s by Vita Sackville-West at Sissinghurst Castle in England, Thomson is planting an area with mostly white flowering plants, including a beautiful white delphinium with a black bee, a white clustered bellflower, Liatris spicata Floristan White, Joan Senior daylily and Immortality iris. Next spring, she plans to add six Oscar Peterson white-flowering roses and will plant them in two groups of three. The new white garden also includes silver-leaved plants such as Snow-in-Summer and Artemisia Silver Mound contrasted with Purple Palace coral bells and Royal Purple smokebush. Vertical and upright elements include Viburnum Snowball tree forms and three Limelight hydrangeas. Two years ago, in order to provide more sunlight to her rose garden, Thomson removed a long dense hedge of 24 Spruce trees and replaced it with a Dogwood hedge. A new border has been planted with 100 Allium Giganteum. Soon another 100 will be added. The new border also includes poppies, globe cedars and Dark Towers penstemon. 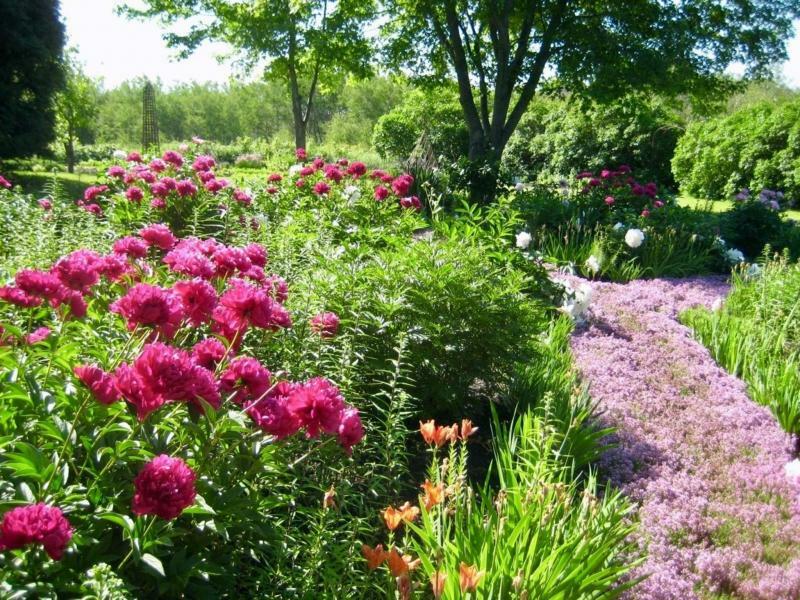 To learn more about Thomson’s must-see garden, visit valsgarden.ca. Tinkler’s garden is also on an acreage. A cottage garden is the first garden room that greets his visitors. A walk through the curving pathways between deep borders brimming with ornamental grasses and classic favourites such as hollyhocks, salvia, scabiosa, coneflowers, Butterfly Bush, clematis, nepeta and more stirs the senses of sight, smell, touch and sound. The lush garden grows almost to the edge of Tinkler’s stunning house, which includes welcoming cedar decks both at the front and back. Sit and stay awhile. There is a natural flow between the house and garden rooms. It is the whole package. The interior of the house with its reclaimed wood floors and wooden beams is designed to look like an English farmhouse. Everything is designed to look as though it has always been there, Tinkler says. While it is the cottage garden where the English country look is most pronounced, traces can also be found in the other garden rooms that Tinkler has designed and created. A substantial L-shaped courtyard garden is surfaced entirely with reclaimed brick. The space is elegant, a touch formal with statuary, fountain and beautifully appointed antique or vintage decor pieces, but also with intimate conversation areas with weathered wooden benches. Throughout this courtyard garden, framed on all sides by greenery, are strategically placed vintage containers, rich in patina and elaborately planted, some with Red Banana (Ensete maurelii) with its giant green leaves with dark red undersides which Tinkler overwinters indoors. The swimming pool area is the location of a contemporary garden with long, low, clean lines. The space includes modern furnishings and accents such as sleek charcoal-grey containers and a narrow herbaceous border in white, blues and yellows. Linear fencing consisting of weathered cedar gives the space a sense of enclosure. Tinkler, who owns Design Manitoba, values authenticity. Like Thomson, he favours structure, form, diverse texture and architectural elements in the garden, as well as a natural flow. Tinkler’s property includes an undeveloped area more than an acre in size which is to be the site for his fourth garden room. 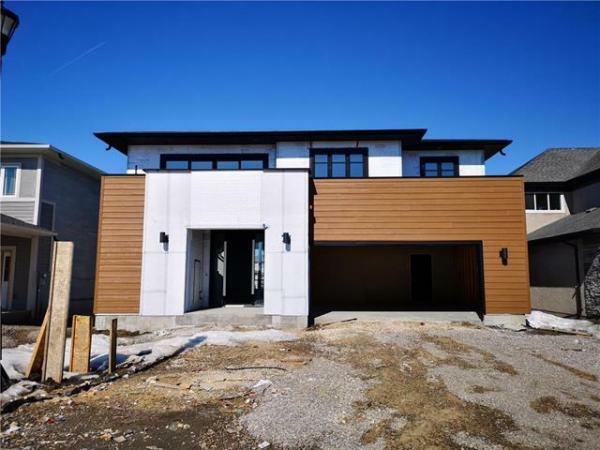 Currently, it includes an elegant cottage greenhouse, a large water reservoir or dugout surrounded by naturalized bulrushes and willows, and a vegetable and cutting garden framed by a rustic fence with horizontal cedar rails between vertical wooden posts. At the outer edge sits a teak bench with a wire sculpture of a man who appears to be contemplating the blank canvas before him. Tinkler is planning a large gravel courtyard. The plantings around the courtyard will be mainly drought-tolerant varieties and include swaths and curves with numerous different grasses, but also plants with distinct architectural shapes such as spires and globes. For inspiration, Tinkler is in Holland this month to visit Oudolf’s legendary garden. Thomson has also travelled to Europe this month to visit gardens. Take a leaf from these two English gardeners and make the design and planning of your own garden a year-round passion. Create the garden of your dreams.